Home » How to Clean Up Drawing Files in DraftSight? How to Clean Up Drawing Files in DraftSight? Clean Up your Drawing in DraftSight to get rid of unwanted Stuff , Reduce Size and increase Performance . Follow These simple Tools and Methods. Go to File > Recover… or Run Command: RECOVER from command line. 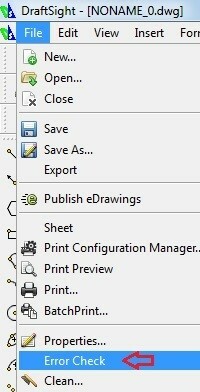 This will pop up a file open dialog box to open existing drawing file for recover. This command is useful to partially recover damaged drawing file. This db will pop up automatically when DraftSight will detect damaged file. This is very useful command to check errors in Drawing file and fix them Automatically. Confirm: Automatically fix drawing database errors? Here you can Clean up unreferenced entities Show in Discardable Entities. 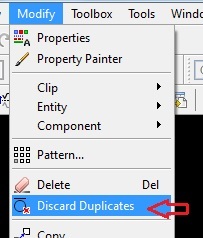 You can select each entity and click Delete button on this dialog box or you Can click on ‘Delete All’ button to delete all entities in list. You can check Referenced Entities by clicking on radio button ‘Show referenced entities’ You can not delete these entities as they are referenced or in use inside Drawing file. 2. ‘Confirm before delete’: This will pop up an alert message to confirm before deleting any entity. This is a new Function introduced in DraftSight 2015. This command will allow users to clean up their drawing file by deleting lines that are created on top of existing lines. For lines that overlap each other, using this command will merge the two entities together. 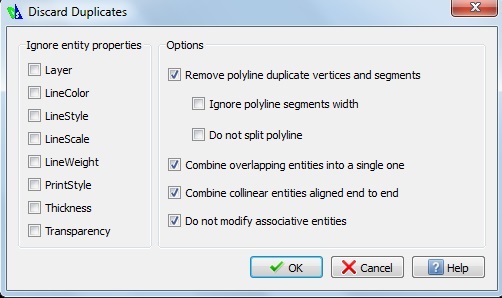 Lets say you have some overlapping entities such as line over line and visually you cannot detect overlapping of entities then this command is very useful. A dialog box with options will pop up. 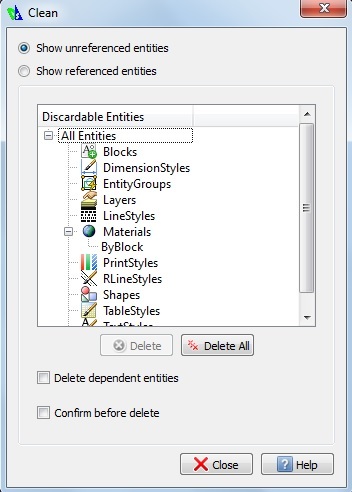 You can tick mark check boxes to ignore entity properties if you want or click Ok .
You can clean up Drawing files as per your or your Company Standards and Settings. 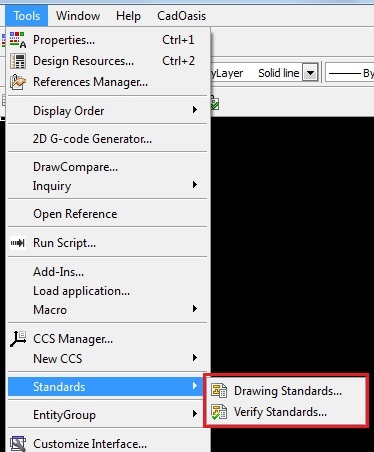 This will Check Drawing Standards in Following Categories delete those Layers and Styles which violates your company standards. Now, In DraftSight 2015 you will get a powerful tool for trimming apart from regular Trim method which is called Power Trim .